Welcome to Al Hadaf, the daily companion for Daf Yomi learners. Join the thousands of gratified readers world-wide who have been enjoying Al Hadaf for over 10 years! Al Hadaf is also used as a source for a "SHORT DAILY LIMUD program" by many people not participating in daf-yomi! Al Hadaf is designed to be of interest and helpful to beginners of Talmud study as well as for scholars and experienced students - and everyone in between! If you're looking for a publication to enhance your Daf Yomi study, or even just for some constructive reading during your daily commute, you've come to the right place. 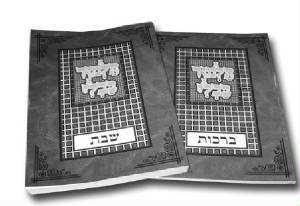 Many have found that they have started learning Daf Yomi just from this journal alone! Al Hadaf has a d'var Torah on each and every daf and is delivered to you either by regular mail or e-mail in advance so that you can use when you learn the daf. To see what we're all about, use the navigation bar on your left to navigate through our simple, easy-to-use site. You can view samples, read articles and testimonials, and then subscribe on-line. For a limited time, New Al Hadaf members are eligible to receive two FREE travel-size Gemora menukads - Berachos & Shabbos - published by Tuvias! See our Subscriptions Page- Current members can order a Discounted Gemara on our Gemara Menukad Page. 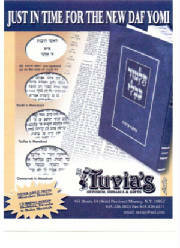 This is a picture of the 2 beautiful FREE Gemara Menukads that you can recieve with your new subscription- Courtesy of TUVIA'S Sefarim, Judaica & Gifts Store. Notice that there are nekudos (vowels) for Gemara, Rashi and Tosfos! Don't forget, You have nothing to lose! Every subscription order comes with a Money-back Guarantee - If not completely satisfied, you will receive a full refund with no questions asked!